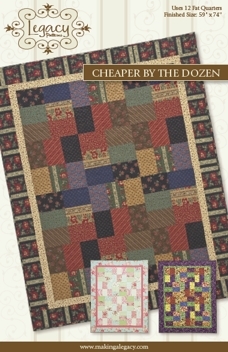 This great fat quarter-friendly quilt uses 12 fat quarters to create a scrappy look. Included in the pattern is an easy-to-use fabric diagram that allows the quilter to see visually how the quilt will go together. Don't think to hard about color choices. This quilt has the look of random color with ease of construction. Finished size of 59" x 74".